After low-lying clouds scrubbed the first attempt, STS-130 took off at 4:14 am in what is scheduled to be the last night launch of a space shuttle. The Space Task Force was on hand for the historic launch of Endeavour–as we will be for each of these ‘Final Five’ launches in 2010. STS-130 is carrying the Tranquility module (formerly known as “Node 3”) along with the special multi-window “cupola” viewport. The crew of Endeavour will spend their first two days catching up to the space station before docking to start their mission. The orbiter is scheduled to return to Kennedy Space Center Stay late on Feb 20 after 13 days in space. Stay tuned to the Space Task Force as we continue our extended mission coverage of STS-130 from rollout to the pad to rollout on the runway. You can also download the video here: STS-130 Launch! This is what it looks like at 4:30am in the KSC Press Center when a launch is scrubbed. All eyes are on the Flight Director, waiting for his call. The launch polling just ended with two “NoGo” calls due to weather. Things have been tentative and getting worse all day. Finally, he makes the tough call and scrubs the launch attempt. Everyone is a bit disappointed, but we know it is the safest thing to do. Now the press, much like the astronauts, must clean up enough to move out for a few hours and come back tomorrow. 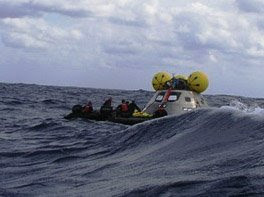 Unlike the astronauts, we can get in our cars and go back to hotels (or for some of us, home to our families). The crew of STS-130 has hours of work to do shutting-down the orbiter and getting out of their launch suits before they can retire–in quarantine–to the confines of the astronaut quarters. And yet, there is a bit of excitement in the air knowing that we get to do it all again. We’d all prefer to have a good launch the first time, but there is also a knowledge that we won’t have many more shuttle launches. Very few of the Go/NoGo pollings are left to call. We’ll cherish every one and, if needed, come back and do it all again. Good night, everyone. See you tomorrow! We were on hand for the incredible night launch of STS-128. The Space Shuttle Discovery took off just before midnight on August 28, 2009. It’s the 128th shuttle flight. We did something a little different for this video, we were at a viewing point three miles away. The camera is on a very smooth surface. The result is a pretty awesome representation of what the shockwaves feel like. Take the time to see one of the remaining shuttle launches, it’s an experience you’ll never forget. More importantly, if you have children, give them the experience of a lifetime, by taking them to a launch. There’s plenty of information on the best viewing points for a shuttle launch. Check out SpaceFlightNow.com or NASA.gov for the schedule of the remaining flights. Wait a minute, what’s that in the water? A big preview of ISDC in Orlando, we’ll take you on a visit to KSC to find two shuttles on the launch pads – and what’s that in the water? Plus Tim takes us behind the scenes for a very special day at KSC. Get ready to spend some time in the “no gravity zone” as the Space Task Force launches right now! George and Tim take you to the front lines of a shuttle launch at the Kennedy Space Center in their first ever video podcast. Launch of STS-120 to the International Space Station, October 3, 2007. A very busy week in space. We cover developments on board the International Space Station and the mission of Space Shuttle Atlantis. Tim talks about watching a top-secret Atlas 5 launch from his driveway and the launch of The Wonder of it All, a new movie dedicated to the Apollo astronauts. For me – it’s all about decorum in Zero-G (Bach versus Korn) and oceans on Mars (wonder what a Mars shark would have looked like?). But wait – there’s more — don’t miss our review of – Mr. Bailey goes to Washington. All ahead on Episode 8 of the Space Task Force.